As I sit here writing, Greg is outside my office window. He has a couple of ladders and is on one about half way up our cherry tree. He is pruning the branches. It looks a little sketchy to me as I watch from this position safe in the house with an ace bandage around my bruised foot, but he clearly knows what he is doing and is no stranger to climbing up ladders, being high up on roofs to clean gutters or being on sides of buildings cleaning windows. He has only fallen once – and it was from a low roof at Christmas time when he was installing lights for someone. He said it happened because he was in a hurry and being a little careless. Luckily he knows how to fall – landed on his feet then did a quick ‘tuck and roll’. No damage to himself physically, but he said he looked around him to see if anyone had seen him, as it was really embarrassing. 🙂 Now if that had been me, I would have put out my arm, probably my right one – and broken my wrist or arm, not to mention other bones in my body. I do not know how to relax into a fall. I tense up and when I fall I always injure myself. Twenty years ago I fell on some jagged rocks at the Ocean in Northern California where we were living. I broke a bone around my right thumb (yes I am right-handed) and had a painful sprain which put me in a cast for 6 weeks. At the time I was the only musician at the little church where Greg was the pastor – so for 6 painful weeks there was no one to play the piano. 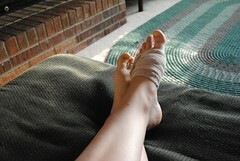 Ten years ago I fell down some cement steps at the church where Greg was on staff in Renton, Washington. I broke my foot (yes my right one) and had to be in a boot for 8 weeks. I couldn’t drive or use the sustain pedal on the piano in that long two months – and to top it off, Greg was in process of installing new oak stairs in our home. There were no side rails – no rails of any kind going up and down, so I just had to hop on one foot and hang on to the wall, when there was one to hang on to. It was loads of fun. All of this occurred to me as I was in Dr. Clark’s office getting an adjustment a few days ago. Because of the jarring that happened during my fall I needed and will need several adjustments on my back. The facts dawned on me as I relayed to him the above events – they happen every ten years! There will be many massages in my future as I get my shoulders, back and neck to relax after last week – but it really hurts to have those areas massaged. This kind of pain is gain and anything that gets me back to normal is very welcome. And as I look back over these events, I smile. I’m pretty clumsy – and I’m truly surprised that they don’t happen much more often! So for now I will heal and try to be careful, “look before I leap” and keep my knees and elbows “in” when walking through doorways – and lift my feet up when I step up on a curb. At least, I’ll try. Today I took our puppy Daisy on her second walk ever with a leash. It has been fun to watch her adapting to a leash for the first time. At first she stood still and wouldn’t move – and now when I put it on she turns her head and tries to bite the leash – thinking she can get the blasted thing OFF! When we walked today, she alternated between stopping to sniff everything in the patches of grass in neighbor’s yards – and getting tangled up in the leash, then stopping and dragging her feet so I would have to pull her. There is some road construction on the road near our home and we walked near it on our circle coming back home. She stopped and looked at the big trucks, pondered for a moment what she should do – and then turned toward home and RAN! It was all I could do to hold her back from her fast TROT – we arrived home today in record time! And it got me thinking – who was the one leading? 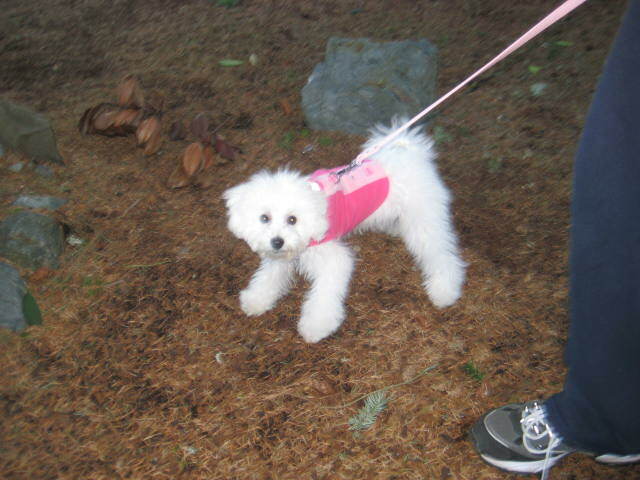 It should have been me – but most of the time because of her inexperience and lack of leash training – it was her. Puppies need to be trained to walk at the same pace as their owners – and not take the lead. They need to learn true submission and hold back natural and instinctive inclinations within them – like bolting, stopping to sniff every few steps and then refusing to move, having to be dragged. This is a picture of what I must be like to my Heavenly Father. He should be leader – but how often do I take it from Him? I like to be independent and do my own thing – stopping and getting distracted with things that look good – but that aren’t especially good for me, wasting time on the wrong things – completely stopping and giving up – even though He is with me and guiding me through tough times – and then just BOLTING – when He asks me to SLOW DOWN and walk beside Him – not getting too far ahead so I can’t tell who is leading anymore. His gentle tug on my “leash” is a gift to me – He is still in charge of my life and sees all the dangers around me – and the temptations. He still needs to drag me through areas I don’t want to go through – and then teaches me patience at times when I want to go ahead on my own – even though my timing for things is not always right. Like our puppy on a leash – I have an invisible one that connects me to God. It is His invisible hand of protection on my life. And like the good Father that He is – He knows what is best for me – even though I sometimes can’t see it. He knows my weaknesses, and my fears – and promises to walk beside me – never taking His hand from my life for a moment, even though I may wander off on my own. Why do I fear the unknown with Him beside me? Can I match my pace with Him? Will I ever learn true submission without question? Sometimes I think I have it – and then I fail again. Help me to be a better “follower” – and not attempt to take “the lead” from your hand. Teach me true submission as you guide me silently through life’s circumstances and situations that I cannot see yet – or even comprehend. Being in charge of my own life is exhausting and I want to give it over to you willingly – without the hint of reservations. Help me with my stubbornness. Help me not to get ahead of your plan and purpose for me life. Help me to be ready for what lies ahead. Teach me to know the sound of your voice so well – that I obey without question when you hold me back. Amen. What is God asking of you today? Can you match His stride? Can you do what He requires of you today? Are you the one leading? Or is it God? Last night I watched a program on the OWN channel that I had recorded from a few weeks ago. It was a “trading places” show – only with a very underweight young woman and a very overweight woman – forced together under a doctor’s supervision to “exchange” eating plans for one week. It was very interesting – and these two women learned much about each other during the process. The underweight woman consuming about 4 times her usual calorie intake for one day – and the underweight on a near starvation diet of toast, tea and soup. When the program began – the doctor explained that putting these two ladies together was actually going to help them both clearly see how they both regarded food in much the same way and had things in common because of that. One avoided and denied – the other used food as a comfort and an “inside hug” – both clearly not healthy approaches to the “fuel” that the body needs to survive and function correctly. I got to thinking about this as I was watching this program. We have more in common with people who are different from us – than we even realize. If we stop and walk around in their body for a while – it would amaze and even shock us! What can I learn from you today? What can I teach you? Today I want to stop and consider before I think anything about you. I want to allow myself to climb inside of you and walk around a little bit – and then hopefully – I too – will understand. 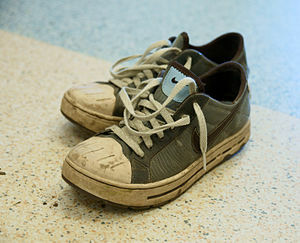 When was the last time you walked around in someone else’s shoes and really understood things from their point of view? Did your perception of them change? Were you amazed at the load they carried? Twenty years ago I fell on some rocks at the ocean in California where we were living at the time. As fate would have it – I broke my fall with my strong side – and my strong hand and arm. My hand was so painful by the next morning I couldn’t move it and had to go to the doctor – who rushed me into x-ray where the technicians move your already injured hand in twisted and contorted positions to get a proper ‘read’. Ouch. Anyway it was determined that a tiny bone was broken and they put me in a cast up to my elbow. I had to wear the stupid thing for 6 weeks – and at the time Greg was pastoring a small church and I was the ONLY one to play piano. Needless to say – we went acappella for all that time I was out of commission. It was terribly pesky – I couldn’t write or anything – even eating was hard – I can’t do anything well with my left hand. Several years ago I fell down some cement steps at our church – on a Sunday morning. It was very embarrassing and painful too. I ended up going to the doctor and found that I had broken my foot. And as fate would have it – it was my right foot, which meant that I couldn’t drive a car – or push the sustain pedal down for the piano – not sure which was worse, being that I am a music teacher and accompany my voice students – it is part of what I do each day. Driving – playing piano with the pedal – it was a toss-up. And to add even more drama – Greg was doing some remodelling in our home at the time – putting wood stairs and railings to our 2 story entry way of our house – so during the time of my ‘infirmity’ there was NO RAILING for the stairs and I literally had to hug the wall coming down from the bedroom to the first floor of our home every time I went back and forth. It must have looked HILARIOUS to anyone watching. 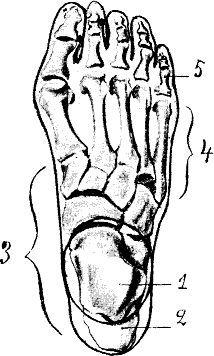 I felt completely handicapped and miserable – didn’t think I’d ever have a normal foot again – and in fact when I would take the ‘boot’ off to shower or to sleep – I was so glad to put in back on again – as I would have the protection – and was afraid of being injured again – my foot was SO tender. While I was in this injured state – Greg drove me to the grocery store one day. We parked the car and Greg came around to get me and walk me in. There was a cross-walk directing in front of one of the entrances and we needed to wait for the cars – or have them wait for us – whichever was the case at the time. When it was clear we started across very slowly. A car that was stopped and now waiting for us to get safely across – and this was now visible to my dear husband. If you know my husband you know that he is the most gracious man in the world – does not have an enemy and always tries to do the right thing. He is generous to a fault and would never want to inconvenience anyone. And so this car having to ‘wait’ for us really bothered him – and he proceeded to drag me across the intersection. Looking back – it must have been hilarious to onlookers. But at the time – I was NOT amused. After all folks – I was handicapped – and I thought to myself, ‘let them wait’! It is different to each of us – depending on how you look at it. And so it is with each of us on this journey – called life. Some are gracious – some are impatient – some let life pass them by – some wonder what happened. I no longer have to wear that cast or boot and I’m glad that I am not ‘handicapped’ anymore. At least in the obvious physical way – we all have our internal disabilities that no one sees. The part that is just between us and God. And those physical limitations are always going to be there – especially the older I get. My shoulders, neck and back are not what they used to be and because I carry all my stress there – during a production week like this one – I struggle all week-long – not to feel handicapped – but to feel normal. Hmmm – what is normal?